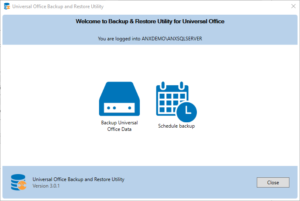 The Universal Office Backup and Restore Utility or simply Universal Backup allows to backup data stored in Universal Office. This backup includes both the data stored in the database as well as attached electronic files. To open Universal Backup, click Start > All Programs > Universal Office CPR > Universal Backup. Alternatively, click Backup Data on the main toolbar when Universal Scheduling is open.